I've built two streams from the group buy and both have serious problems with the audio from channel 1. At least one other person I've heard from is having the same issues with boards from another source, so I'm wondering if maybe there's an error in the eagle project files. Has anyone had similar issues with streams? Has anyone been able to build a working streams from the files? edit: it is software, and it's fixable, gbiz has found that changing one line of code sorts it out. Did you build them using the parts list (BOM) extracted directly from the Eagle files, or the pre-production BOM in the Google Doc spreadsheet that Olivier Gillet published? If the latter, check it against the canonical Eagle BOM. Olivier clearly stated that there were discrepancies between the pre-production BOMs and the final released version. The audio pathway through Streams is all analogue, thus if you have distortion in one channel, it seems more likely to be a hardware issue. The fact that you get a signal at all in channel 1 suggests wrong component values rather than a PCB problem, but a missing trace could be the problem. Of course, the usual practice for people selling PCBs for DIY is to successfully build at least one instance themselves first, as a basic quality assurance step, before selling them to others. I built straight from the Eagle BOM, so I don't think there's a problem with the component selection. While troubleshooting the first one a multimeter probe slipped and sent 12v to the mcu so I built up a second only to have the same symptom. It could've been a coincidence but after hearing that someone else is having a similar problem I suspect it's with the boards or software. I've checked the gerbers used to make them against Olivier's eagle layout and can't find any differences in the traces. Adam says the drill holes are a bit larger but I don't think that's the problem. In some modes my second build does produce audio in ch1 but in the compressor mode it doesn't pass anything. A manual continuity test using a multimeter on a bare PCB from the same batch might be worth doing. Rather tedious to do, but at least the audio pathway for channel 1 could be checked. Also check that all the traces that run along the long edges of the actual boards are as they should be. I had one set of boards come back from PCB fab in which they had shifted the entire layout about 2mm to the right, which meant that traces running along the edge of the board were actually in thin air. I didn't discover that until after I built up the board. Fixed with several jumper wires to substitute for the missing traces. I've successfully built many of the ARM based mutables so I was surprised I couldn't get this one going. My AVRISP can not see the MPU. I was able to reprogram a production Grids with the same set-up so it's not my programmer. I have a new MPU on order- we'll see what happens. This is a depressing thread, but could it be static electricity related? I recently repaired a factory-built Grids which probably had its MPU fried by a spike on the 5V power line in the rack it was in. After replacing the MPU (and the op-amps and the 74HC595), I had the same problem - my AVRISP mkII wouldn't recognise the MPU. I had previously successfully flashed two DIY Grids using the same programmer. Changing -B 1 to -B 4 in the makefile solved the problem. Changing -B 1 to -B 4 in the makefile solved the problem. That worked! Thanks so much. Now... Strangely everything seems to work correctly but running very slowly. For example- it takes about 10 seconds of holding the switch down before it will enter the config mode. I'll look into the fuse settings tomorrow. That worked! Thanks so much. Now... Strangely everything's seems to work correctly but running very slowly. For example- it takes about 10 seconds of holding the switch down before it will enter the config mode. i've also problem with channel one. I built two units and both shows exactly the same behaviour. In the compressor mode channel on is much more quieter than channel two. I triple checked all connections and the eagle schematics. Also the calibration is fine. I cannot imagine that Oliver published wrong files or a wron code. so I have no Idea waht can be the reason. On the other hand it is strange that several persons running into the same problem. Maybe the v2164 is wrong, i've got mine from small bear. Boards are from OSH Park. 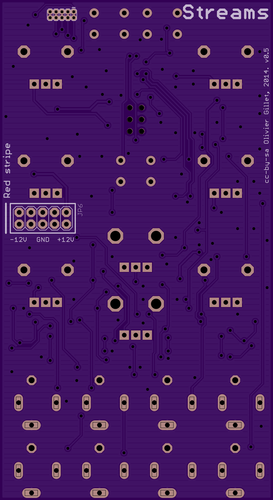 Same exact issue here with boards from Oshpark. I've been probing around and haven't found any bad traces yet. I'm still getting audio in the other modes on channel one, the responses just aren't as predicted. Compressor mode isn't working on channel one at all though. I noticed the Voltages output on test point 1 do not match up with test point 2, so I've been searching around the circuit to find the issue with no luck yet. i wonder if it isn't working because it only works in exponential mode and it's too linear or something? did you say you'd looked at all the component values on both channels and found they were the same? Compressor: works only properly in exponential VCA mode and when level-mod is in it's minimum position. The excite input works as a sidechain for the Input signal and the excite level determines gain reduction. If only IN is used, the module works as a normal compressor. Attack time is fixed to 0.2ms and decay to 150ms. MOD: in 12h-position no compression happens; counterclockwise signals are tamed and clockwise low signals are boosted. need to be increased to ensure stability of the output amplifier. Before speculating about Olivier's hardware design being flawed, which seems very unlikely since he tests his designs very thoroughly, and the module is in successful production, the obvious thing to do is to sit down with a bare OSH Park PCB, a multimeter and the schematic and do a complete manual continuity test on every trace that is relevant to or associated with channel 1, in order to eliminate a systematic fabrication problem, possibly with the way the OSH Park fab plant is interpreting the Eagle files. I would have thought, in these circumstances, it is the responsibility of the person selling these PCBs to undertake such tests. As I mentioned earlier, usual practice for anyone selling DIY PCBs is to build up at least one example themselves to make sure the PCB is sound and that everything works as expected, before selling them to others on a commercial basis. I built an Anushri which slowly died over time. I checked the solder joints, all components and even asked Olivier to send me a replacement MCU (which he did free of charge) to no avail. After spending about 16 hours or so troubleshooting and re-soldering I gave up on that build. I built 20 odd Euro and other kits before, so it may just be bad luck with a particular component. That said I have another Anushri kit with Mouser components on my docket to build this fall. Given that I had built an Ambika 6-voice and several Shruthi, I know it's not the design but the builder in my case. I will really take my time with the next Anushri build and check everything step-by-step, no assembly when I am tired at night. After that I will do the Klee euro sequencer and heaven forbid I screw that one up. I can't really see why there should be any difference between the channels though as they are identical -- certainly shouldn't have anything to do with the liner Vs log response of the VCA. I assume that channel 2 works fine? Can you check the DAC outputs if you have the same settings? 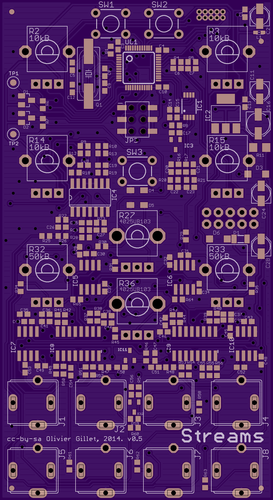 It looks like there are signal traces under a lot of the pots, and the oshpark solder mask is probably less robust than what Olivier specs. I'd start checking with R14 where there's a via for the MOD setting from that pot to the mcu, and R36 where the via carries the lin/exp setting for channel 1 from R27. Yes, absolutely - the OSH Park solder mask is quite thin and can easily be scraped off by even slight mechanical friction. For my MI module builds on OSH Park PCBs, I fold up the little tabs under the pots so they don't sit on the PCB over any traces. You do need to marry all your pots and jacks up to the panel before soldering them if you do this, otherwise they are unlikely to be exactly perpendicular to the PCB (which is what the little tabs that sit against the PCB are for - to keep them nice and square to the PCB). The same issue applies to the jack sockets. The Ripples I built had the traces re-routed so they didn't lie under the jack socket skirts, but now I just apply two layers of Kapton polyimide tape (which is highly heat-resistant as well as being an insulator) to the PCB under the jacks, and poke holes in it for the jack socket legs and connection lugs to poke through. That ensures that mechanical friction won't wear through the solder mask to cause shorts. Of course, if the sockets and pots are rigidly mounted to a stiff front panel, then there shouldn't be much ongoing friction, but it pays to be careful, I feel, if you want the module to have a long life. i don't know - oshpark is really high spec generally, even solder mask in the vias i think. But the tabs bennelong.bicyclist mentions have a sharp edge, & could very possibly wear through solder mask over time. His advice to bend these back is good. But if this were the cause of this issue, i could understand one or maybe two modules being affected by it, it can't see all of them suffering it. Another thought on this, relevent to Streams here. With PJ301B's, the jacks are taller than the Alpha pot body. Some people trim the tabs off on these jacks so the pots sit flush on the PCB and mount flush to the panel. If you leave the tabs on the jacks & mount the pots flush to the panel, these tabs on the pots won't be in contact with the PCB, so this is a non-issue for the pots. It'll still apply to the jacks though.